after you flip it back over (gently) you will find 4 keepers at the top of the keyboard these need to be pushed in while pulling up on the keyboard.. to release it. sorry the pictures don't show very well got to work on Macro Picture taking .. more light better zoom. After all of the clips are released the keyboard will be free to fold back on the touch pad.. 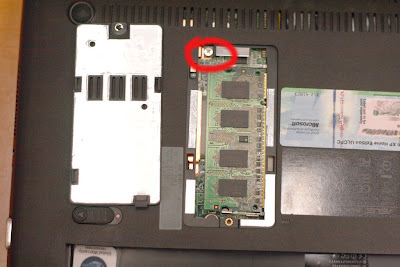 It might not seem that way but as long as you have all of the screws out including the one in the memory bay it will come loose ... there is a piece of double sided tape that is adhered to the keyboard as well (shown in later pictures). But don't just rip the keyboard up ... you have to remember the delicate ribbon cable underneath still attached to the system-board. 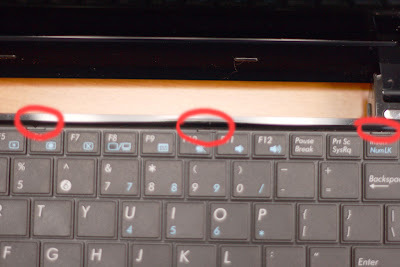 fold the keyboard back on to the touch pad and you can get to the ribbon cable for the keyboard and the touch pad. And I have an arrow pointing to the double sided tape that caused a bit of trouble taking the keyboard off .. though there was a hidden screw somewhere. 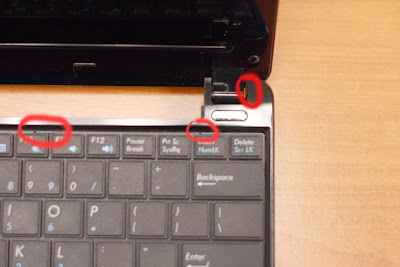 there are plastic keepers all the way around the chassis you need to wedge the CC or Spudger all the way around the outside of the laptop including up by the LCD screen until all of the keepers come loose they snap .. sounds like you are breaking it .. just be very careful. once you have the top bezel free if you have not already disconnected the track pad ribbon do it now..
Good Luck in all of your endeavors.. Thank you for your informative blow by blow guide to upgrade the hard drive for my Eee. It worked flawlessly (upgraded to a seagate momentus 5400 500gb). It looks like you have room to to install a larger drive (maybe 1TB/12mm vs. 500GB/9mm) if the bios supports it. The Credit Card trick worked well and a hair dryer did the job on the warranty sticker. I'm typing this response on my Eee and the whole transplant took about 20 mins. Thanks so much for the details and pictures. These instructions work for the 1005PEB as well. You made my day... Thanks you so much of your hard work and saving my time. 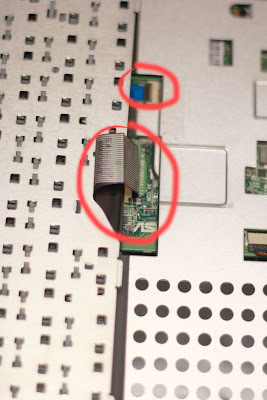 I couldn't find the answer to my question, though: Is there a mini-pce slot on the motherboard of the netbook? I was hoping to install a smallish SSD to run the OS off of, while leaving the HDD for storage, etc. Is this possible without extensive mods, or would I have to lose the wifi card or something else? Thank you in advance for your help! Your tutorial was brilliant. 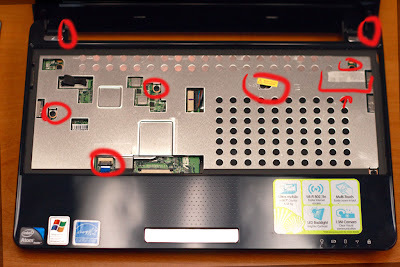 The only thing that I would like to add is that to remove the KB (at least on this particular model), there are 4 metal clips located in the battery compartment. If you lift these taps outwards, they will release your KB. I used a small screwdriver and carefully lifted them out. After that, I was once again using your instructions. 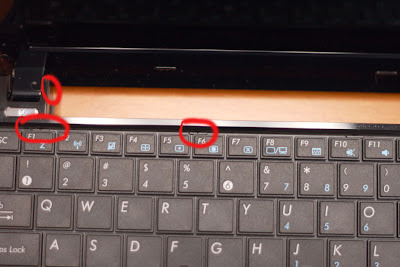 If you find these tabs, then the KB pops out in seconds. So, thank you for the tutorial. Brilliant!!!! 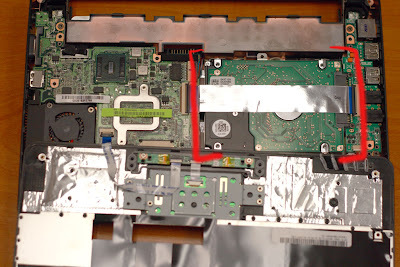 I used your demonstration to help me switch hard drives on my Asus Eee netbook. The biggest problem I had was getting the clips for the keyboard to release. When I reassembled the computer and pushed the power button, nothing happens. I have opened up the computer three times now and can't find any connections unconnected. Help! Maybe one of the other readers have some suggestions... and will comment. Thanks for the guide - got stuck, but the bit about the keyboard tabs got me on my way. Much appreciated! Many thanks for your guide...the keyboard was what had me stumped...and I've worked on a good number of laptops! For future readers - just above the keys on the keyboard - press the little nub up towards the LCD (away from you) and work your way across. To the person who couldn't get it to turn back on - my first guess would be the cable that goes across the hard drive. The power button is on the right-hand side, the motherboard at the left - the power signal would have to travel across that cable. 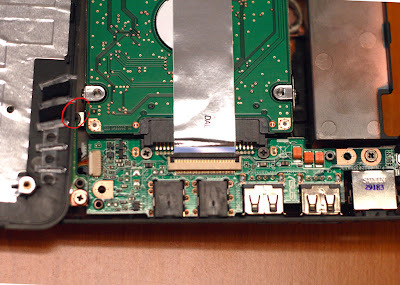 If you don't have a spudger use the plastic SD card slot filler thing that comes with the netbook. Works just as well. Cool. Appreciate the help! Worked like a champ! spudger! LOL. I always called it a scribe. You learn something new every day! Thanks for sharing. I didn't have the spudger I use for iPods at hand. My thumbnail worked fine on the 1005HAB plastic, though. Thanks for the steps - it was pretty helpful. However, Mine had six screws holding it in, and I wish you could have had a better explanation of removal of the ribbon cable for the keyboard - I chipped mine trying to remove it, but it still works. Thanks very much for the tutorial. I waited six months for the day I would be able to focus enough to follow through all the instructions step by step. Today was the day and I'm feeling pretty good about it. I got my harddrive out but the enclosure is across town. I'll retrieve my data tomorrow and try and reinstall/put it all back together tomorrow. Sure beats no repair nor replacement because of finances. I also really hate to waste something electronic that can be fixed. Thanks again.